As I continue to ponder my bathroom renovation (not a lot of action yet, just planning and fixture buying) I am finding the shower the hardest component to work out. I thought I would find it easy as my initial plan was to keep it simple. 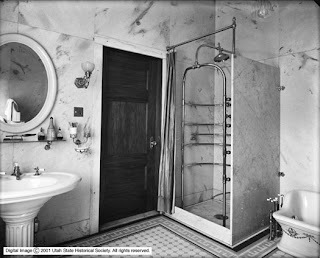 I am really taken by the shower above (photo from William Hefner), particularly with the shaped marble "wall". But with the French limewashed oak flooring that I am planning to have, I cannot have an open shower like this one. A frameless glass door would get around this problem as it wouldn't take away from the look. 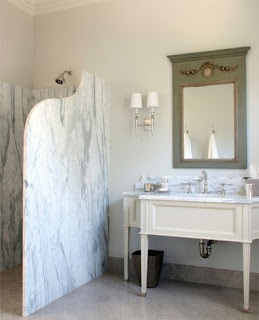 And doesn't an antique mirror in a predominantly all white bathroom look great? This French trumeau style mirror is perfect. And lighting to the side of the mirror is a great idea, I will have to do this. 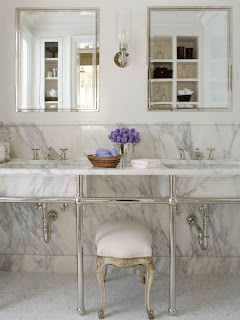 I love the use of marble in this bathroom, it doesn't really help me with my plans but it is just a lovely room I couldn't resist sharing. The stool looks great, too. And can you believe that the bathroom in the two photos above is actually over 100 years old? It is from an American 1907 catalogue. That shower is really amazing. It really does prove that classic styles never date! I would love to have this bathroom transported through time (and continents) to my home. This would be a dream place to shop - Waterworks in New York. 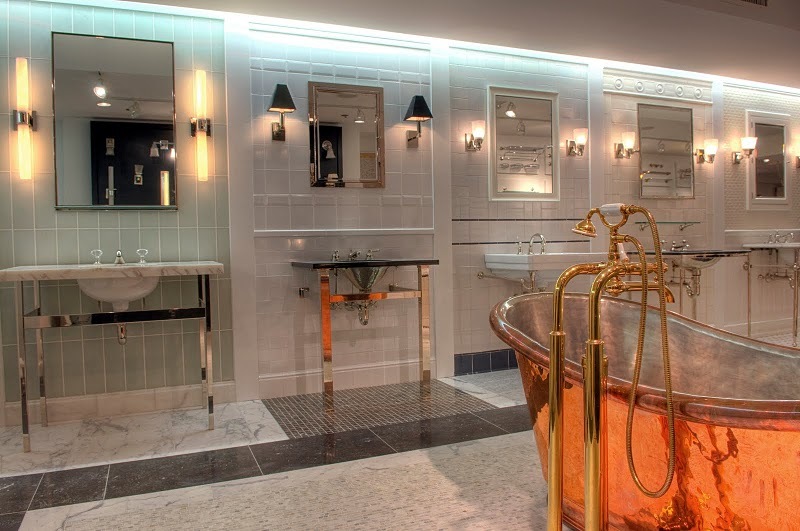 Check out the copper bath! 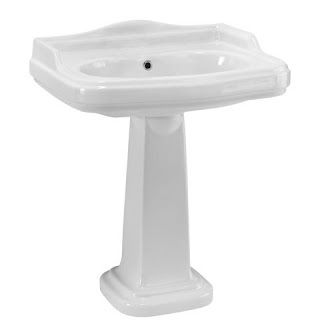 We were lucky enough to find this pedestal basin drastically reduced at a closing down sale, thanks to a tip-off from a friend. And we have decided on some Nicolazzi tapware (which is extremely good quality and classic, our kitchen tap is a bridge faucet Nicolazzi tap and we just love it) which are now being distributed in Tasmania. 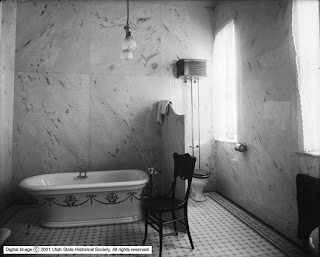 If anyone has any thoughts on marble showers, I would love to hear.